Appreciate the everyday and Experiment . . . But the worst part is, I am so focused on my never-ending ‘to-do’ list, that I rarely slow down enough to appreciate the amazing little things that happen every day. Over the Christmas break I became inspired by Blogging your Passion, which encouraged us to state our ‘mission’ for our blogs. It was intimidating at first, but I kept coming back to my desire to value my everyday experiences – and be able to share them with my customers and friends. Creative Friday – this actually a resolution started ages ago, but had fallen to the wayside with house hunting and moving. 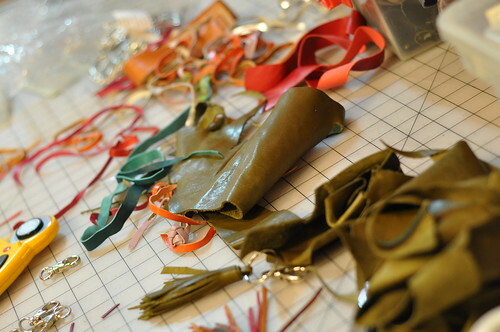 Creative Friday is the day that I allow myself total creative freedom – usually it is a chance to try out new ideas and experiment with new leather scraps for bags. I really miss making one of a kind handbag designs and Fridays will be dedicated to doing only that! By doing each of these things, I will hopefully become a better blogger. I would really like my blog to become a ‘community’. . .and I would love to hear from you! What are ways that YOU appreciate the everyday?